Not everyone likes fine dining. The portions are too small. The ingredients are too pretentious. The waiters are too snooty. And the prices on the menu are simply impossible. But the semi-final between Spain and Germany, in which Spain scored the only goal and progressed to meet Holland in Sunday's final, was one strictly for those who enjoy an eight-course footballing menu. Half a mile from the Indian Ocean, these two European fine-playing countries, offered their best chefs and cooked a meal for the connoisseurs, rather than the casual diners. Casual diners can enjoy the torso of Cristiano Ronaldo, the hair of Lionel Messi, the dullness of Uruguay, the soap opera of England. This meal adorned with subtleties. Like fine wine, the game needed a little time to open up. In the first half. Spain expressed its strategy very clearly: If Germany never gets the ball, Germany cannot score. So the Spaniards passed it around and around. It was, perhaps, the first time that the Jabulani had been treated with such respect. One almost felt sorry for the Hungarian referee. He found it hard to find a reason to blow his whistle. He found it hard to find a tackle that merited his attention. Actually he found it hard to find a tackle. The ball was being moved around with such grace and efficiency that, for anyone trying to press it, it was like trying to press a firefly. As for subterfuge, it's hard to dive when the defender never gets close enough to you before the ball has moved on. Still, after six minutes Pedro put Villa through the middle. Neuer came out to make a good save. Spain's Carles Puyol, third from left, scores a goal during the World Cup semifinal soccer match between Germany and Spain. After thirteen, Iniesta hammered the ball across and Puyol-- oh, if only it hadn't been the hairy Catalan defender, Puyol-- flung himself at the ball and the ball at the stands. Germany were sitting back, biding their time, waiting for the speedy counter attack. But that's what seemed to be lacking: the speed. Perhaps in an attempt to prove that it takes at least three Poles to get to a World Cup final (Klose and Podolski are also Polish-born), Trochowski, in for the suspended Muller, came closest for Germany with a skidding shot to Casillas' left. But the one inch, the one swift step, the one inspiration needed to make a breakthrough wouldn't come. Until just before the break. Enjoying a fast and furious foray upfield, Ozil was put through the middle. His first touch was imperfect. But so was the challenge by Sergio Ramos. A penalty? Of course. On some days, with some referees. Ramos' knee went into the back of Ozil. But the Hungarian referee seemed stunned that a foul had actually been committed. Perhaps he deemed it too soft for a game of this magnitude. The second half turned into one of those European movies in which people talk a lot and nothing seems to happen. Not something that would win an Oscar. Not something that would have them rushing out to the multiplex in the mall. Pedro's shot was well saved by Neuer. Iniesta burst through and just crossed too hard for Villa. As Spain's Rioja began to open, Germany needed a little Riesling. Something a little fresher, sweeter. But every change Coach Jurgen Low made seemed to offer nothing of the remarkable change of pace that had characterized Germany's demolitions of England and Argentina. After what seemed like 20 consecutive minutes of Spanish passing, Germany suddenly fashioned a chance. It came through the right side. Where once it might have fallen to Muller, now it fell to the substitute Kroos. The moment overwhelmed him. His shot was too tame, too straight, too devoid of imagination. This was a mashed potato finish when it needed, at the very least, a little gratin. With 18 minutes to go, the constant Spanish heat affected the German kitchen. A corner from the left approached the head of Puyol--oh, thank goodness it was the hairy Catalan defender Puyol. This was a simple, cheap, nay, free header that seemed entirely out of place in such a refined game. The only player who had challenged him was his own fellow central defender, Pique. Germany hasn't actually won a major trophy for 14 years. And that was only the European Championship. Somehow, this leaden, prosaic recipe suggested they still weren't ready. Indeed, Pedro should have squirted some cordon bleu icing on the Spanish torta, when put clear on goal. Too much overcomplication, too much sugar, meant that he lost possession, where a pass to the unmarked Torres, or at least a shot might have allowed Spain to ask for the check. Still, the Spanish held on through dessert and now the country can savor its first ever World Cup Final. 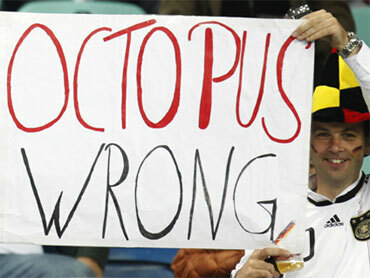 Perhaps the German chefs should have listened to their octopus. The octopus, which has not once failed to pick the winner of a game, even with the scrutiny of the world press upon it, had picked Spain before the game. There was much teeth-gnashing in Germany. Yet the octopus had read the menu correctly again. If he picks Spain in the final, and Spain wins, will the Spanish take him back to the great Catalan restaurant, El Bulli, to see how its remarkable head chef Fernan Adria, can turn this octopus into one dish, or even several? That would surely be a meal for the ages.